Seismologist Lucy Jones: "There will be aftershocks over the next few days"
A 7.2 magnitude earthquake has hit the Mexican peninsula of Baja California, killing two people and causing tremors as far away as Nevada. Some people are still trapped in their homes in the city of Mexicali, where a state of emergency has been declared. The quake struck at 1540 (2240 GMT), 26km (16 miles) south-west of Guadalupe Victoria in Baja California, according to the US Geological Survey. It was the worst quake to hit the region for many years, officials said. 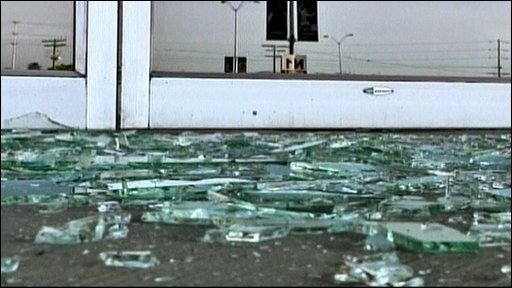 The US Geological Survey said some 20 million people felt tremors from the largest quake to affect the area since 1992. It struck at a relatively shallow depth of 10km, the survey said. Mexican civil protection officials said a man had died when his home collapsed outside Mexicali, near the earthquake's epicentre. Another man was run over by a car in Mexicali after he ran out of his house during the quake, officials said. Rescue teams with digging equipment and sniffer dogs have been despatched to the worst-affected areas of Mexicali from the nearby city of Tijuana. The regional government declared a state of emergency in Mexicali, a city of about 900,000 people. The quake caused buildings to sway in Tijuana, where Easter celebrations were interrupted as families rushed for open ground. There were power cuts and hospitals and public buildings were evacuated in Mexico's Baja California state. In the United States, firefighters were called out to inspect roads, bridges and power-lines. The LA Fire Department also responded to a number of automatic alarms and people being stuck in lifts, reports said. Rides were temporarily suspended at the Disneyland theme park in California. Many readers who contacted the BBC spoke of the "surreal" swaying of buildings for up to a minute, although Steve Rider from Palm Springs in California said it was "the most powerful earthquake I have ever felt". Kyle Stockburger, in Los Angeles, said: "Everyone stopped talking in the restaurant and the overhead lights started swaying back and forth. It wasn't violent, just unreal. It felt like the whole earth was swaying."